As companies divvy up more workloads between in-house IT systems and off-site Software-as-a-Service providers, it’s gotten much harder to pinpoint the source of a problem when an application hangs. Is it a local router? A bad VM? An internet issue or problem at your favorite SaaS provider? Traditional performance monitoring tools may be fine for keeping tabs on what’s happening in house, but not so great at what’s happening outside. At least that’s the thinking behind ThousandEyes, a San Francisco startup emerging from stealth Wednesday at GigaOM Structure. Built from the ground up to attack this distributed performance monitoring problem, he claimed ThousandEyes does a better job than older tools. In that camp, it competes with offerings from IBM/Tivoli(s ibm), CA (s ca), HP (s hpq), and NetScout and also with dev favorite New Relic. 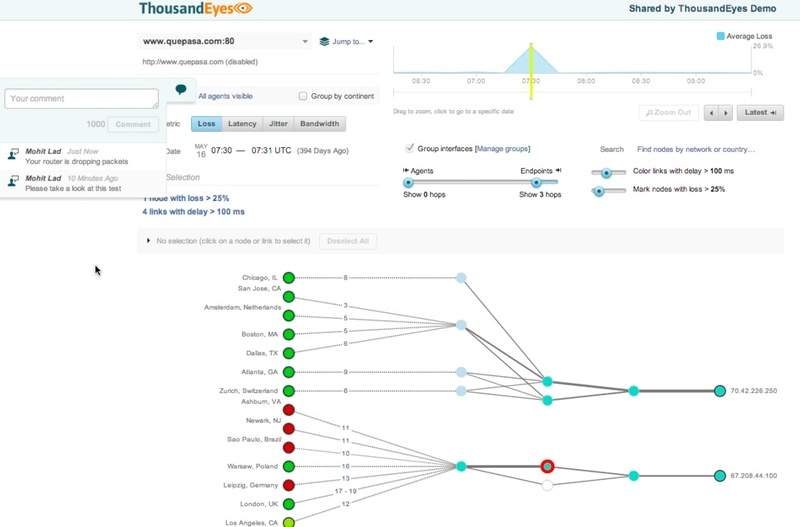 ThousandEyes’ says it can look at all your internal application stacks but the rest of infrastructure and also push beyond all that to check out the internet path between your site and your SaaS providers and even look into their stacks to see if the problem originates there, ThousandEyes co-founder and CEO Mohit Lad said in a recent interview. Of course that means ThousandEyes has to sell into two constituencies, the end-user company and the major SaaS providers. The company is already doing that, Ladsaid. Several of the top SaaS providers, including “a very large” but unnamed CRM vendor are aboard, he said. Other customers include Evernote, Priceline, ServiceNow, Twitter, Zendesk and Zynga plus some Fortune 500 companies. ThousandEyes also just garnered $5.5 million from Sequoia Capital and angel investors to keep building out its service. There are two delivery models. Public agents for use by cloud providers, banks and other online sites to monitor their own infrastructure are priced per test run. Private agents, for use by enterprises in their branch offices, cost a flat fee per month and can run as many tests as capacity allows. To foster cooperation rather than finger pointing between internal IT staff and SaaS vendors, ThousandEyes also makes it easy for an admin to take a snapshot of what he or she is seeing on the console and share that with the vendor personnel via a shared URL. A Twitter-like message thread also lets different teams keep track of who’s doing what about the issue. Mohit and his co-founder and CTO Ricardo Oliveira were both Ph.D’s in computer science at UCLA. It seems clear that companies will keep using more off-site SaaS services along with their own internal applications so tools that can troubleshoot both sets of IT should be attractive going forward.